If you’ve been breeding long enough, you have met “That Puppy”. That Puppy is one who, while his littermates are quietly napping or playing, is screaming at the top of his lungs. Maybe he hollers after midnight, or bellows in the morning, or has a midday tirade every day? Such a puppy can drive a breeder to distraction. Of course when a puppy is vocalizing for no apparent reason we should first consider the puppy’s health. Is That Puppy gassy? 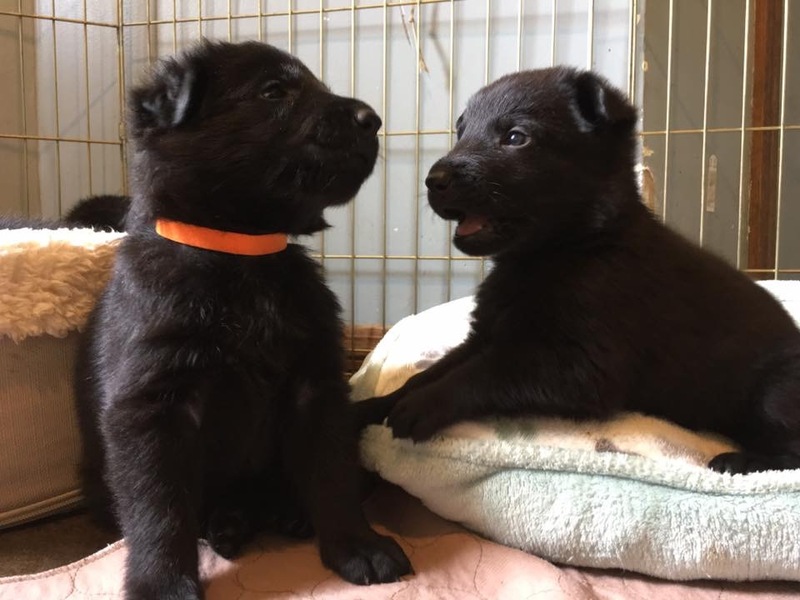 A bloated gassy puppy has a very good reason to vocalize! So first run through a list of That Puppy’s basic needs. 1. 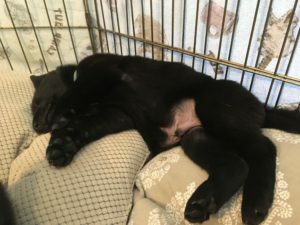 Pain– Is this puppy in pain or uncomfortable? Is a vet check warranted? Could That Puppy be gassy, or have a stomach ache from weaning, or over eating, or parasites? 2. Hunger– is this puppy “hangry” because it’s been pushed off breakfast by larger puppies? Does it need a snack? 3. Thirst- is clean water available? 4. Warmth/cool- is the climate of the weaning pen comfortable? We readily think of puppy’s being chilled, no breeder wants that, but some breeds *cough Malamute cough* appreciate being able to get cool. 5. Rest- is there a place for this puppy to rest? Some puppies rest better in a “single size” bed, some really want to snuggle with other puppies. Further, can the puppy rest without being constantly awoken by playful siblings, household noises, nannies or over tending mothers? If any of the Basic Needs are lacking, addressing those is our starting point. But what if we’ve met all those basic needs? Indeed for skilled and responsible breeders these basic needs are second nature, attended to with great skill, and never lacking. But still…..That Puppy bellows! One can never imagine the volume this wee mite can muster! This is when the train can fly off the tracks. Faced with That Puppy, that loud, loud puppy, breeders try to figure out why. Why just *That Puppy*? 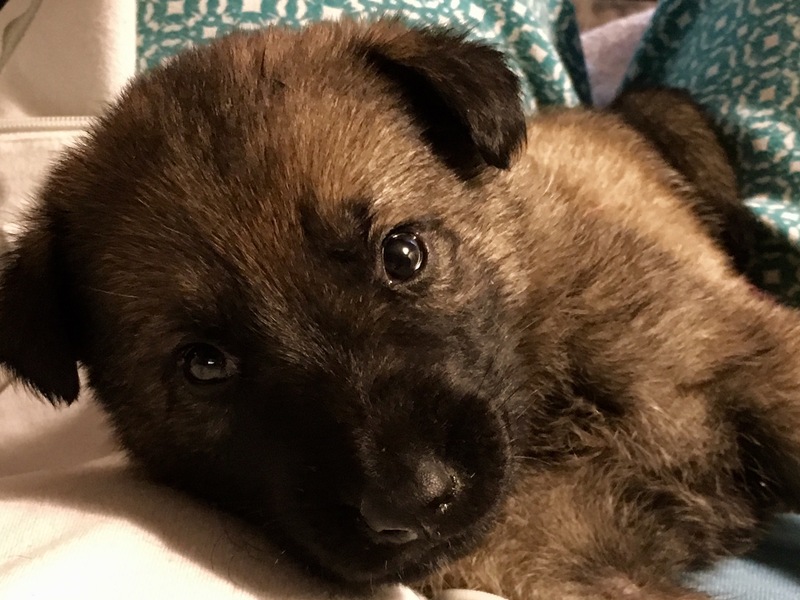 At this point, faced with this difficult puppy we often get distracted and off track because we, even though we know more about puppies than anyone, start to assume that a baby puppy is like a tiny adult dog. We don’t let adult dogs out of crates when they fuss now do we? (Let me add, I’m not advocating leaving any dog to scream it out, but that’s a subject for later). So great is the fear we will “teach” a dog to vocalize to control us that we forget that puppies are not tiny adult dogs. So entrenched is this advice to ignore, that we never question it. We then start to throw out labels, now That Puppy is: Bossy, High Strung, Demanding, Manipulative, Dominate. That Puppy is trying to CONTROL us, the human, heaven help us! But is it really? First, remember that if we decide to frame a dog’s behavior (of any age) with a negative label we then tend to put ourselves in a dead end. After all, if a puppy is having a temper tantrum, being manipulative, demanding, bossy or whatever now we have suddenly made this “the puppy’s fault” or a problem with the puppy itself, we are now in a battle of wills with this puppy. We must win, right? Labels are so limiting and they can close off how we think about behavior into one narrow road with few solutions. The Puppy screams because he’s difficult, and he’s difficult because he screams. This offers us no path to resolution. So if we think a puppy is being in any way “naughty” we start to think along the lines of “teaching the puppy a lesson”, that it can’t control us and that bad behavior won’t “work”. This limits us to basically one common answer, IGNORE the puppy (or much worse, punish the puppy by squirting it, or tossing a penny can, or scruffing it). Otherwise the puppy “wins” and that means we are the looser because the puppy learns to vocalize to demand release. But, this is at best really limiting, at worse damaging, and may indeed completely miss the mark, the “point” or function of the behavior. Always remember, puppies exhibit behavior as a response to the environment. How such a young puppy responds is less about high cognitive functioning, learning, and manipulation and more about basic instincts. Puppies are hard wired to respond to distress vocally, this is basic survival advantage stuff. Puppies are hard wired to want to “be with” humans and dogs (that order may be switched depending on the breed traits at play). We literally domesticated dogs so they want to be with us, they are driven to be with us. This instinct combines with breed traits and developmental stages to create a variety of behaviors. Learning plays an increasing role as the puppy matures, but it’s not the primary player in baby puppies. So instead of asking ourselves how we can punish a puppy (something we are inclined to do if we think of the puppy’s behavior as being deliberately bad) by ignoring it (removing something needed or desired) or punishing it (adding something the puppy would like to avoid) we do better work by the puppy if we look at the puppy acting this way and take the behavior “at it’s word” and think of the puppy as struggling, as an emotionally immature individual struggling with frustration, or perhaps separation distress, or fatigue, discomfort, or over arousal. When we frame our puppy in this light, we can see a variety of potential solutions before us, so many, instead of few. 1. Look for a pattern. Does the fussy behavior occur before meal time? In the evening? In the middle of the night? Jot down in your litter notebook when the fussy behavior happens and always confirm which puppy is vocalizing. This is really helpful in designing an intervention, but sometimes we don’t need at plan at all because the function of the vocalization becomes readily apparent in the pattern. For example, if a puppy eats and then cries for an hour after, our solution may be in the feeding. Puppy is under eating, or over eating, or the food doesn’t agree with the puppy. 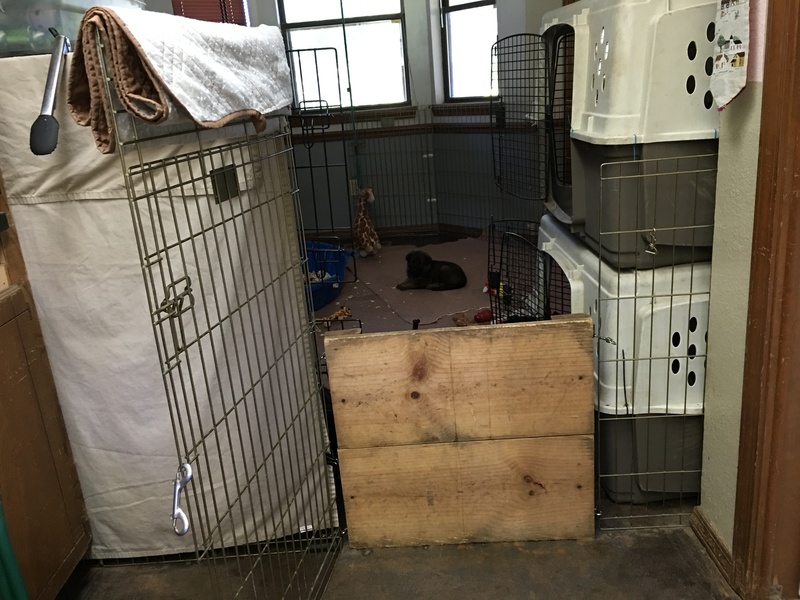 The gate to my puppy area, from the busy kitchen, with the visual block closed so my puppies can relax. 2. Take advantage of visual blocks. Barrier frustration is a real deal in certain breeds and it can start young. 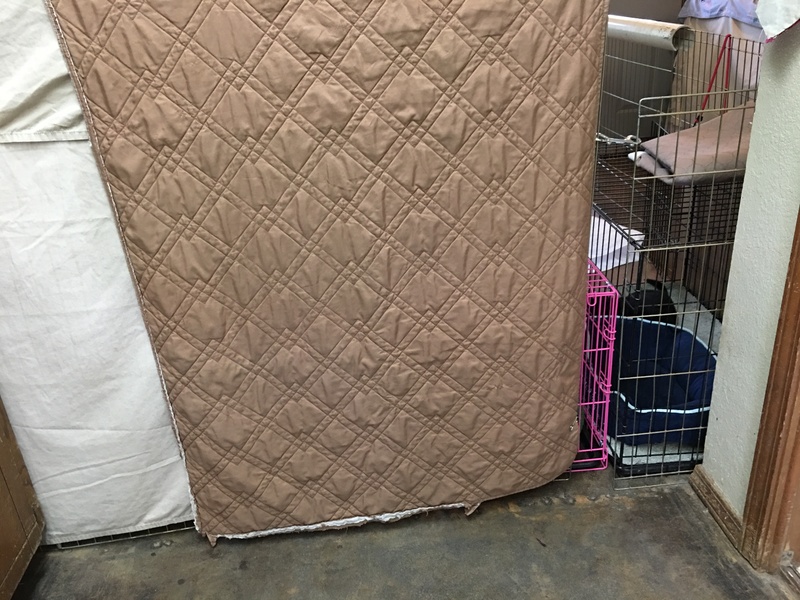 I use sheets (I like sheets because they are easy to close and open) on the outside of the pen, this one thing has decreased puppy distress by 90% in my home. Use visual blocks strategically “in the moment” to help a puppy lower it’s arousal and distress at being separated from others in the household. If the pen walls are covered already, try uncovering it, or a part of the pen to make a window. This sheet lowered down the side of the weaning pen allows Heron to rest peacefully. 3. Dramatically increase novelty within the pen. Remove and rotate toys often, increase the cognitive effort a toy takes, use snuffle mats, novel odors, kibble dispensers, small platforms, really make the pen interesting and engaging and time these changes to right before the high risk times. In my own puppies, this is usually where my solution lies. German Shepherds are clever puppies, just tossing a few toys in won’t always be enough. But a snuffle mat? Or a bunch of horse hair stuffed into a toy, or a kibble nibble, yeah! Something that requires some sniffing and figuring out! That can help a puppy self calm and relax. The toys on this mobile can be changed daily, chews, or scented items can be hung. 4. Spend more time with the puppies in the pen yourself instead of always taking them out. Mix it up a bit. 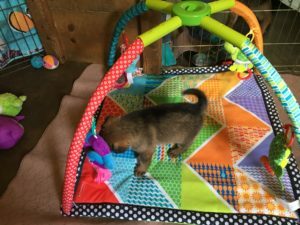 How often do we accidentally teach puppies that being outside the weaning pen is better? Too often all human interactions are outside the weaning pen, all novelty is outside the weaning pen, and meals are outside the weaning pen. NO WONDER puppies long to be out of their pen! Make a real effort to condition puppies that being confined (in a pen at first, and a crate later) is WONDERFUL! 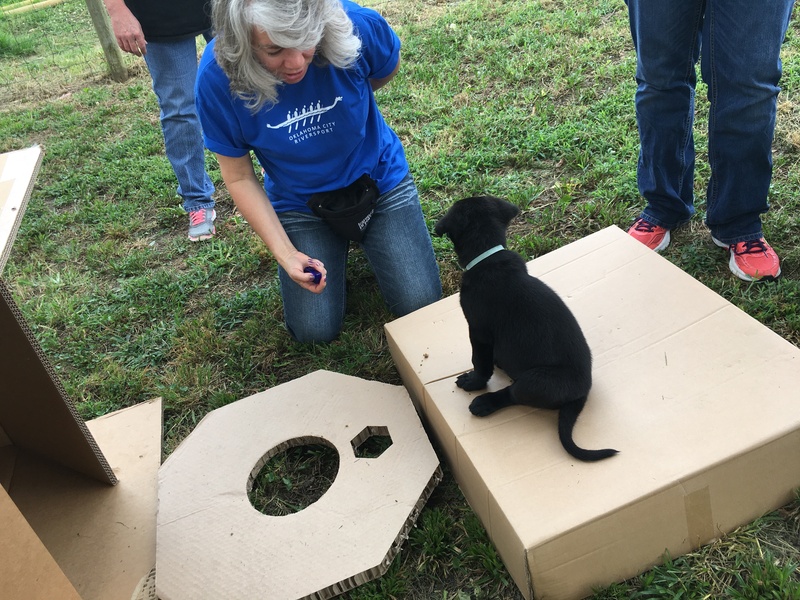 Put the puppies OUT of the pen and then have a clicker training session INSIDE the pen, one puppy at a time. Sit inside the pen sometimes for play time and visitor time. Put novel smells and items in the pen for exploration sometimes. 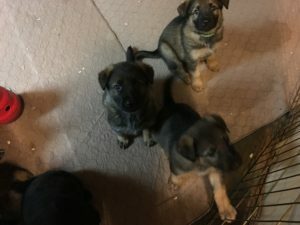 Now, I’m NOT saying “don’t take your puppies out of the weaning pen” , that would be insane, but I am saying to make your weaning pen just as much fun as the other parts of your house. Spend quality time inside the weaning pen with your puppies, so outside isn’t always better! 5. So, on that note, be sure your puppies time outside the pen, counts. Plan sniff walks in a puppy safe yard, or if it’s better, do a sniff walk inside! Collect novel odors (I use chicken feathers, bark from trees, horse hair, and cat hair often) and plant these along with some treats around your room. Start easy, and make each snuffle walk just a tad more difficult. Before you know it your puppies will be experts at using their noses to find the hidden novel smell. This type of “thinking” exercise will help puppies rest better when returned to their pen. Be sure to salt the pen with a snuffle mat, or kibble nibble, so when the puppies return they have an activity to help them calm down. This puppy’s time outside the pen features a shaping lesson! 6. If you have a safe skilled team of nannies, make sure they have a hop in (a low point in the pen that allows a nanny to enter AND LEAVE the pen at will) so they can interact with the puppies in the pen. I have one nanny who is always first to sooth a frustrated puppy. So I make sure she can! Now, again, do NOT EVER lock any adult dog (even the dam) in with the puppies. There must always be an escape route for any dog to leave the weaning pen. I use a board that my nannies, nannoes, and the dam can jump in/out of the weaning pen at will. If you have a skilled nanny or nanno, this dog can soothe a fussy puppy by modeling quiet behavior, or by just attending to the puppy’s need, but it’s not desirable for a dog to actually punish the upset puppy. Just because an older dog uses an aversive doesn’t make it more desirable than a human! So always use your common sense when supervising nannies. 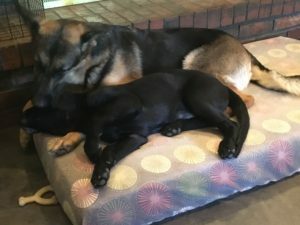 Just like a human trainer, a good nanny can shape and model desirable behavior without risky techniques that can create more serious problems than the one being solved. This board allows my nannies and nannoes (and the dam) to enter and leave the weaning pen at will. Also note the gate can close and the visual block is pulled up. When Frankeigh was unable to calm down, he was removed from the pen and given over to Nanny Zahra, who laid down, invited him to join her, and then groomed his head until he fell asleep. 7. Plug in a DAP or spray some. I love DAP for the weaning pen. It’s very soothing for puppies in general. If you use the spray you can spray the area as needed, the diffuser works all the time. I will tell you, if you have a diffuser plugged in, you can spray more when That Puppy starts to fuss. 8. Soothing music is very helpful. Soothing music, or a boring audio book should make up the bulk of the “background” noise for your litter. Sound conditioning and habituation should never be nonstop, our ratio is around 75% soothing sounds, no sound, intermixed with 25% sounds we are either conditioning or habituating to. If I have a fussy puppy, I always make sure I have soothing sounds at the ready! Dap and soothing sounds can help puppies feel calmer when confined in the pen. 9. Teach Manding pen side. 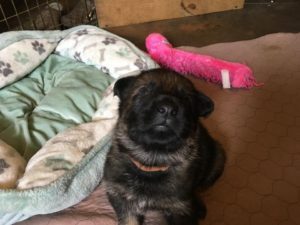 If you reinforce sitting pen side your puppy can take advantage of Manding (a learned behavior) instead of screaming (a natural behavior) at the side of the pen. Create a Success Station near the side of your pen, with written instructions for the humans who pass by, and a small bucket of treats for the puppies. Teach all the humans to pop a treat into the mouth of any puppy who is sitting quietly pen side. A work in progress, puppies learning to Mand at the side of the weaning pen instead of vocalizing and bickering. 10. This is where things get really crazy! I do the opposite of many, when I have a puppy who frets and yells I don’t ignore That Puppy. Using my Pattern (See 1 Above) I try to remove That Puppy before it gets upset (ideally when calm) because I am aware that learning is happening, and I want to reinforce calm behavior. But if I have a puppy who is screaming in the pen I no longer leave it to freak out. I really don’t want all that stress hormone activity, it’s not worth “teaching it a lesson” to have an immature brain awash in cortisol or other stress hormones. That just primes the puppy’s brain to use more in future (totally anecdotal, I’ve only my own experiences on this). I want less vocalization, NOT more vocalization. This is the opposite of what I was taught. I was taught to always ignore a fussy puppy, because a fussy puppy is being manipulative and trying to control people. But what I found as a breeder, is that ignoring a distressed puppy really just means I have a puppy who is MORE often distressed and for LONGER in the CSP. But when I started to attend to fussy puppies, almost like magic, they were less often fussy and they stopped being fussy much sooner. What I had been taught wasn’t actually effective, for me, the puppy, or the new owner. Now, not in the middle of the night, and not every time a puppy peeps a squeak! I use my breeder judgement to tell me when a puppy is complaining, versus when a puppy is distressed. A mildly complaining puppy just needs a few minutes to settle down, something I can aid with a pacifier. But a puppy who is vocalizing intensely, I might look and see if I have a huge Bull’s Eye pupil for example, a high respiration rate, or pacing, to give me clues about what is best. If a puppy is truly distressed, or has worked itself into a cortisol fueled fit, I’m no going to ignore that. I might win a battle of wills, but I lose the war. But, happily, I almost never have a fussy puppy since I use this approached based on Dr. Susan Friedman’s Humane Hierarchy . This one thing has convinced me that a fussy puppy is NOT a difficult individual, or a dominate puppy, or even bossy, because not only are those just labels, but those things would not have been resolved by MORE attention and MORE toys and MORE activities. NO, what I have learned is that my labels, and the advice I was given, were flawed in the first place. What I really had was an immature animal using the tool kit nature provided it attempting to get it’s needs met. Tiny tyrant or misunderstood floof? When I look beyond the label, a ton of possible solutions are presented: add or remove visual blocks, add or remove enrichment, add or remove nannies, add or remove activity, add DAP, music, chews, food based activities, add or remove the individual puppy or puppies. So many good options! 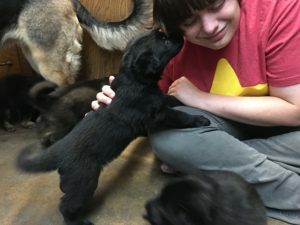 Lots of options are better than one option (ignore) and allows us to serve our puppy’s needs better with less risk of unexpected negative effects or undesirable learning. Also, by 6 weeks we are well into our crate conditioning protocol and this really helps to prevent fretting and demanding to get out and provides me with another option! You can also find help in my littermate interactions article. Much of this works just as well for a single upset puppy as it does for pugnacious behavior within a litter.